Launched in 2009, as Secret Men’s Business, gained immediate success by winning the 2010 Tattersall Cup, having success in all major events Australia wide, also finishing in third place in Division Z of the 2013 Rolex Fastnet Race UK. Since Victorian John Newbold purchased Primitive Cool, she has had a significant impact on racing in Victoria and currently holds the Melbourne to King Island Race record. 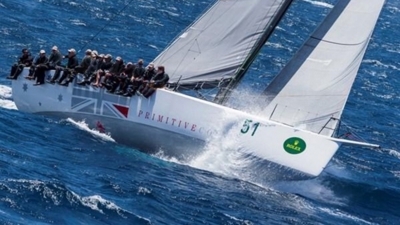 Primitive Cool moved to Sydney in June with the team enjoying having the opportunity to race against some of the best 50+ footers in the world. Added to the existing crew (hailing mainly from RMYS) are three talented Sydneysiders, a Canadian and an Englishman. Primitive Cool will again be representing Sea Shepherd in the 2018 RSHYR - an organisation that all associated with the team passionately support for their love and tireless protection of our oceans and its wildlife. “The on-board crew ethos is to race hard, get the most out of a super tough purpose-built ocean yacht while having a terrific time doing so. The yacht, given the right conditions, can still surprise the best of the TPs,” said Newbold.